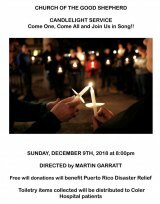 At 8:00 p.m. on Sunday, December 9th, the Church of the Good Shepherd, 543 Main Street, Roosevelt Island, invites you to join in song at their 38th Annual Candlelight Service. Small, unwrapped toiletries will be accepted on behalf of Coler as well as donations for Puerto Rico. The Carter Burden Network invites you to "Join us for a very important General Meeting with Executive Director Bill Dionne at 2:00 p.m. regarding fundings for the programs at the senior center." That's on Tuesday, December 4th. 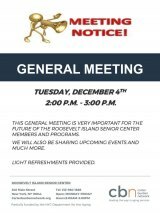 The Roosevelt Island Senior Center is at 546 Main Street, Main Floor. As President of the Roosevelt Island Residents Association, Lynne Shinozaki's promised to reach out to the community, involving more people and promising inclusiveness. She'll get her chance next week with her first full Common Council meeting, December 5th at the Good Shepherd Community Center, lower level, at 8:00. Cornell Tech said, earlier this week, "We are pleased to invite you to the third Cornell Tech faculty presentation in our new program, Community Conversations with Cornell Tech Faculty series. 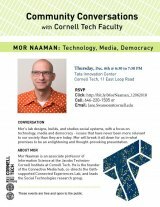 Faculty member Mor Naaman will be our lecturer on Thursday, December 6th from 6:30 to 7:30 at the Tata Innovation Center at Cornell Tech. 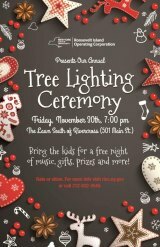 Last year, RIOC's holiday tree lighting event brought more excitement and entertainment than previous years. For 2018, they hope to duplicate that success on November 30th. The party begins at 7:00 on the Rivercross lawn. 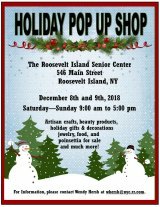 A Holiday Pop Up Shop will fill the Senior Center, 546 Main Street, with gift ideas and holiday cheer. Costco will be there with a special offer on membership. In an unprecedented move, RIRA Common Council Member and Island Services Committee Chair, Rossana Ceruzzi, released a proposed agenda for her committee's next meeting, aiming to involve residents in decision making. Breast cancer is the second most diagnosed cancer among women. Mammograms can help. 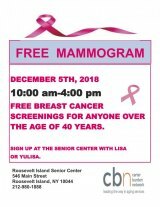 The Carter Burden Network offered a free screening to anyone over 40 - men included - on December 5th at the CBN/RI Senior Center, 546 Main Street. The most effective vehicle for teaching history involves bringing characters from the deep past to life in the present, still in costume, still in character. 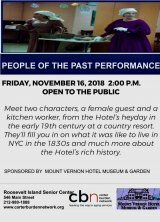 That's what's happening at the Senior Center on Friday, November 16th at 2:00 as the Mount Vernon Hotel Museum and Garden transplants a 19th Century resort at 546 Main Street. 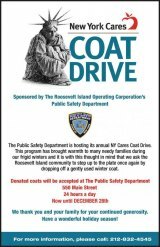 Today, RIOC announced the Public Safety Department's annual New York Cares coat drive. Roosevelt Islanders donate warmth to less fortunate neighbors.